“Welcome home!” they say, with a look on their faces that shows such an immeasurable joy that can only be expressed by someone who has stood in my shoes before, holding a key to a new home, the first home, that I’ve ever owned. Their excitement cuts through the air, and it’s so thick with transitive joy that you can almost taste it with every breath you take. They remember every second of their experience so well, the excitement and joy of owning their first home, of finally having a place to call their own, that they can almost relive that moment with you, put themselves in your shoes and experience it all over again, smiles so wide and excitement so strong that I’m afraid the panic I feel inside me is not hidden by the mask of an attempted mirrored reaction to their own. The truth is, they’ve never worn my shoes before. And I’ve never worn theirs. I cannot touch that world, a completely different universe I have never experienced running parallel to my own. I do not understand their excitement, their joy, what it is within this moment of walking into an empty building for which I now own a key inspires such an incredibly emotional response. I don’t understand the roots that they’ve created in a house, this single structure that they call “home” that attaches to its name so many different meanings and feelings and collective understandings that are so foreign of concepts to me. For me, it is all so strange. I am watching the excitement on visitors faces, as they look at the new house and get increasingly jovial as most first culture kids do with the concept of owning a “home,” and they reflect the feelings they expect me to have, of joy, excitement, new futures and a commitment to a single place as the place I want to be. They shine with anticipation of those thoughts and feelings they expect me to have, and I shine back, but not because I feel those feelings or think those thoughts, but because this entire experience is so foreign to me that I mirror them as they mirror what they believe they see in me. If they knew the truth, though, they would not find excitement and joy at the prospect of owning a house. I love my house, I will not deny that. I love the space, the property, the location, the neighbours, the convenience, the quiet, and the noise. I love that I don’t have to worry about stepping too loud for the people below me, finding a parking spot at night, or climbing three flights of stairs to get to my door. I love the smell of it, the newness, and the fact that I have moved into something that really is mine where I am not constantly being watched. That only I have a key to my door, no manager, no technician, only me. As a Third Culture Kid, though, there’s a void in the understanding of value that my friends and family see. Their memories of their first home were memories tied to the concept of a word that is lost on me. Home has true meaning to them, growing up within a culture that understands them, that embraces them, and that they embrace back knowing full and well they belong there. A house isn’t just a building to them, it’s a symbol of a connection to a location, a group, a culture, for which represents them to their core. But my home isn’t in their culture. It isn’t in a building. It is out there somewhere, in the uncomfortable arms of an economy class seat, in a baggage claim department with signs written in characters I cannot read. It’s in the taste of spices I cannot remember, in the smells that abandoned me of the places I cannot see, and in the sounds of streets that echo in my memories. It’s in the hum of an engine as I fly through the air, in the back of my Grandad’s garden, at the local pub down the road, on an under-maintained bus running along the side of mountain. In the people that have shaped me, have made me who I am, who will make me who I continue to become. As I look into eyes that falsely mirror emotions I am meant to feel at this new “home,” I can feel my heart breaking. Not because I do not understand the concept of home that they embrace so completely, but because they will never understand the beauty I see in not feeling what they expect me to feel. If they were to read these words, their responses would be many, but I find it hard to believe that any of them would be happy. They would see my lack of excitement perhaps as a lack of appreciation for a culture they love, perhaps as a lack of respect for the possession I have. They may judge me for not feeling as they do, for not appreciating it to the level as they do, all because I do not understand the fundamental concept behind everything a home means to them. I am not sad for the lack of understanding of a home. I’m not even sad because I do not see the world through the same lens as those with whom I choose to spend significant portions of my life. I’m sad because these words speak only to my TCK brethren: The world that we see and the world that we live in is not the same place, and the beauty I long to share is lost in moments of lack of understanding and an inability to convey a world-view that cannot be gifted unless the tides of our youth happened to flow in the same direction. But now, it is too late, and the barriers are set, no matter how hard we try to share our world with others, or have them share theirs with us. We run parallel to each other, seeing the same things side-by-side from an entirely different perspective. And while that is beautiful, it is also heartbreaking, for while the experiences are close, they will always be separated by the same little gap between understanding. This entry was posted in Uncategorized on March 4, 2015 by James R. Mitchener. 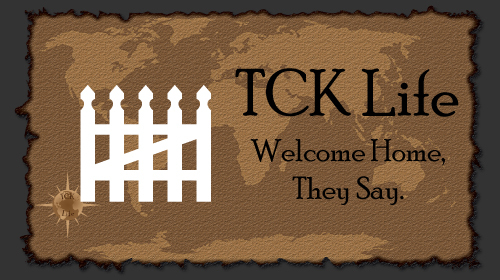 A TCK Life world map that can be customized for any of your travels. Interested in seeing one with your name on it? Let me know, and we’ll see if it’s worth production. Currently designed to be produced on an 18″x24″ canvas. If you missed One World Week’s Social Integration discussion, here it is online and ready to view. I had an excellent time with The University or Warwick and would like to thank all the students who put so much effort into making this such an enjoyable experience. I am the fourth and final speaker before the Q&A section. This entry was posted in Uncategorized and tagged global culture, multicultural debate, One World Week, social integration, TCK, TCKs, Third Culture Kids, university of warwick on March 8, 2013 by James R. Mitchener.